Stop it. Stop. Just stop it. No, I’m not talking about the Harlem Shake. I’m talking about you talking about the Lakers. Stop it. The Thunder, at the bottom of the league with 15.5 turnovers per game, had 2 last night. Russell Westbrook*, athletic, speedy and aggressive, had 37 points to go with 10 rebounds. and was far more efficient than usual. 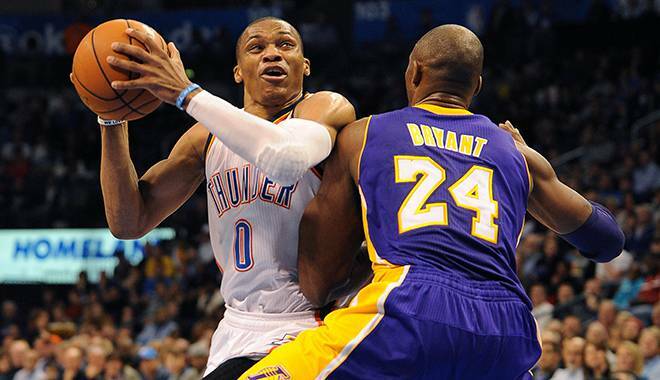 *=Westbrook also played opposite Kobe, and even stripped Bryant to seal the game. The Lakers are a team built to play one way, they are coached to play another way, and they can win if they play a third way. And they don’t play any of those ways. They just play old. And yet, they lead news stories almost every night, and there is grumblings that they may still be able to contend in the West. When the Lakers are in the half-court game, they aren’t terrible. They’re ranked in the top 10 in points and offensive efficiency, averaging 102 points at home. But it’s not their defense necessarily that’s the problem; it’s the way they give up points. They give up more fast break points than any team in the league (16.6), and are in the bottom three surrendering points in the paint per game (44.9). Wait that is the defense. That’s and old, slow defense. That’s a defense unwilling to play physical, or even hustle back. That’s a defense that not even Phil could save. Kobe can talk trash and the Lakers can win back-to-backs, but they wouldn’t be able to compete in a series against the top five teams in the West. It would be best for everyone involved if the Lakers missed the playoffs this year. It would force management’s hand, maybe giving them cause to move Pau Gasol. But the Lakers don’t belong on this side of the fence this year. This roster can’t take it, and it has nothing to do with basketball strategy or shot selection. They’re old and it happens and its okay. But please, talk about Paul George, or how good the Warriors might be, or whatever is going on between the NBA and Lil’ Wayne. But not the Lakers. They’re toast.